Eight-hour hands-on course tailored to your specific needs. Includes upper/lower face and neck neuromodulators; fillers to tear troughs; cheeks, lips, ears, and hands. Includes an introduction to ArqueDerma® methodology, but does not include full ArqueDerma® licensee material. Includes a Training and Reference Manual. 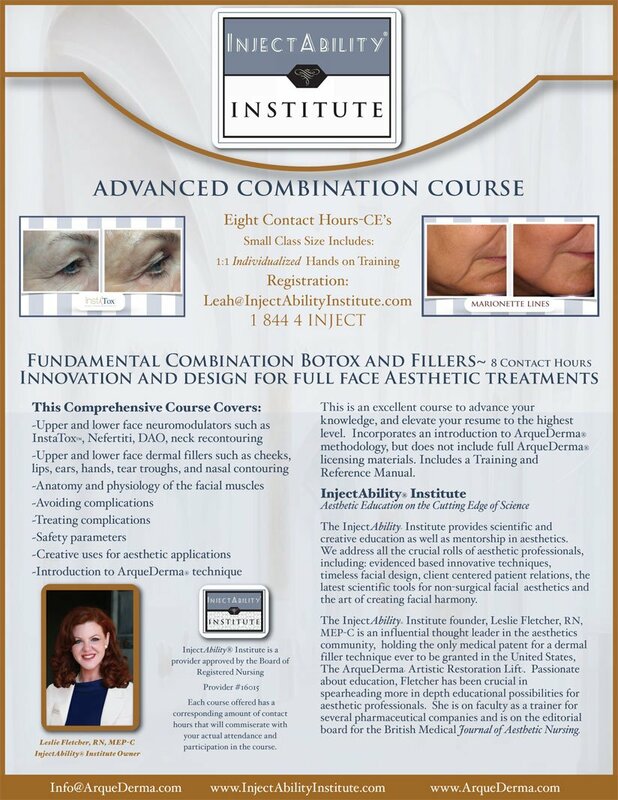 A four-hour didactic-only art course focused on redesigning the human face using non-surgical, aesthetic applications of neuromodulators, dermal fillers, and pharmaceutical skin care. Discussion of cultural beauty, facial harmony, facial thirds and facial fifths, symmetry, and facial topography. A comprehensive plan for designing your patient’s face. Includes a Training and Reference Manual. A four-hour didactic course that explores the use of current FDA neuromodulators to enhance, not obliterate, facial expression. Learn how to precisely target muscles of the upper and lower face and neck to enhance the patient’s ultimate beauty. Includes a Training and Reference Manual.